DONETSK, Ukraine -- Russia says the declaration of a state called "Malorossiya" (Little Russia) in rebel-held eastern Ukraine is just a rebel leader's "personal initiative". Alexander Zakharchenko's "Malorossiya" declaration has been widely criticised. Alexander Zakharchenko announced the new "state" in Donetsk, saying it would replace Ukraine. The pro-Russian rebels broke away from Ukraine in 2014. Kremlin spokesman Dmitry Peskov said "we remain committed to the Minsk accords". The Minsk ceasefire is shaky as shelling and skirmishes continue. More shelling took place on Tuesday. The Ukrainian military reported heavy rebel fire on its positions in the Avdiivka area, a hotspot just north of rebel-held Donetsk. It said two Ukrainian soldiers had been killed on Tuesday. The self-styled "Donetsk People's Republic" (DNR) said one civilian had been killed and two had been wounded in Ukrainian army shelling of some residential areas of Donetsk. Over 10,000 people have died since the eastern Ukraine conflict erupted in April 2014, soon after Russia annexed Ukraine's Crimea peninsula. A ceasefire was agreed in February 2015 but its terms are far from being fulfilled. Western governments accuse Russia of helping the rebels with regular troops and heavy weapons. Moscow denies that, while admitting that Russian "volunteers" are helping the rebels. 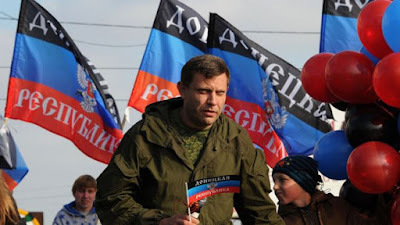 Politicians outside Donetsk have distanced themselves from Zakharchenko's "Malorossiya" declaration. Peskov said it was Zakharchenko's "personal initiative" and Moscow had "learnt about it this morning [Tuesday] from media". Pro-Russian rebels in the neighbouring breakaway Luhansk region also dismissed the "Malorossiya" declaration, despite being allies of the DNR rebels. A pro-Russian president, Viktor Yanukovych, fled Ukraine's capital Kiev during violent protests in February 2014 but ties to Moscow remain strong in the Russian-speaking east. "Malorossiya" in tsarist times referred to Russian imperial territories that later became part of Ukraine. Many Ukrainians today regard the name as offensive and synonymous with Russian imperialism. Kremlin plan or genuine surprise? The declaration of a new country based on "the state formerly known as Ukraine" seemed to come out of the blue. Even state TV presenters appeared taken aback as they announced the rebels' creation of "Malorossiya". But was this fantastical plan really the "personal initiative" of Zakharchenko, as the Kremlin spokesman claimed? Some here are sure it was. They believe the rebels in eastern Ukraine are getting restless and that this move shows the limits of Kremlin control. Moscow, they point out, wants to look committed to the Minsk peace process - at least in public. Others though dismiss the reaction as theatre: the Kremlin's rejection and even the "surprise" of the TV anchors. To them, the Donetsk rebels remain loyal puppets of Moscow. The US has just appointed a new envoy for the Ukraine conflict who has already visited Kiev, but not Moscow. So they see this announcement as a warning: that Kiev should be pressured to implement its side of the Ukraine peace deal, or the situation there could get even worse. A "Malorossiya constitution" published on the DNR official website says the new "state" is a successor to Ukraine, with Donetsk as its capital. It proclaims as its flag the emblem of Bohdan Khmelnytsky, a 17th-Century Cossack who led a revolt against Polish rule and forged an alliance with Russia. The DNR language echoes the "Novorossiya" (New Russia) idea that Russian nationalists and the Donetsk rebels championed earlier in the conflict. Ukrainian President Petro Poroshenko saw the declaration as further evidence of Russian involvement. "Since the start of military aggression against my nation Russia's goal has been to fragment Ukraine," he said. "The Novorossiya project included nine regions of Ukraine. This project collapsed utterly." He called the Zakharchenko leadership "a puppet show, parroting messages received from Russia". The "Malorossiya" declaration was ignored in Russia's main evening TV news bulletins - after Peskov's comments about it. The main channels are state-controlled. But earlier on Tuesday the declaration had been prominent on the Russian TV news.